In exactly two weeks, as the clock strikes 12:00am and Thursday, February 1st begins, Golden Tee World Championship qualifying starts! 64 competitors. A weekend in beautiful Las Vegas, June 8-10. Over $100,000 in prizes. One grand stage at The Orleans Hotel and Casino where we will crown our 10th Golden Tee World Champion! 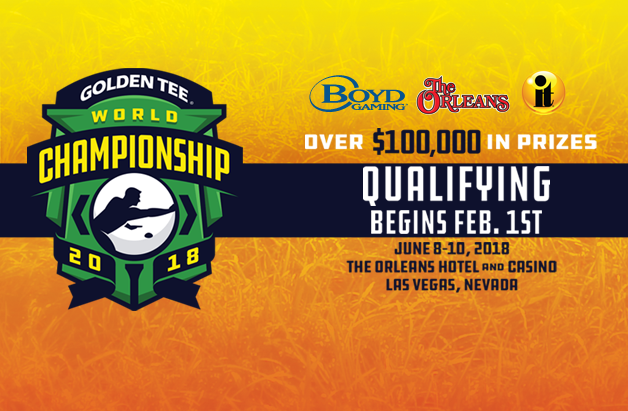 The Golden Tee 2018 World Championship will be the boldest, biggest and brightest event the game has ever known—a high-stakes weekend that will provide a tremendous spotlight on the most celebrated arcade golf game as it nears its 30th anniversary. The vast majority of our tournament field will be filled through a Prize Play qualifier. This qualifier will run between February 1 and April 11, providing players with five different chances to secure a spot. This particular qualifier will be broken down into five separate two-week events. During this two-week time period, players will be asked to post five scores for all five 2018 courses (5 on each for 25 total). The 10 players who have the most combined strokes under par after two weeks—with Great Shot Points in those counted games serving as a tiebreaker—will qualify. Remember, games played with different cards or IDs cannot be combined, so be sure to check in with the same ID each time you play. Players can play as many games as they wish during this time to improve their five posted scores across all five 2018 courses. Once each two-week event has concluded, the leaderboard will be cleared and the next opportunity begins. The 10 players who qualify the previous week will be removed from any future leaderboards, and we will begin anew. The process will repeat until we have our 50 players. ​Please note: all games must be played and completed in traditional online Prize Play. This is for you, Alaska, Louisiana, New Jersey and South Dakota. For those of you who live and play Golden Tee in a state that does not allow Prize Play, you can still qualify for the Worlds. During the month of March (March 1-March 31), players who live in these states will be able to qualify for a spot in Las Vegas simply by playing on their favorite cabinet. The format for this qualifier will be the same as the Prize Play qualifier mentioned above, only this event will last a month. The three players who have the most combined strokes under par with their best 25 games—five for each 2018 course—will secure a spot for Sin City. Scores from online Stats and Contest (Glory) and Invitational games will count. Please note: all qualifiers must be a resident of the NON PRIZE PLAY state that they qualified in. If you are the proud owner of a Golden Tee Home Edition that is up to date with the 2018 software, you’ll want to listen to the following. Four Home Edition owners will make their way to The Orleans in a qualifier that will take place starting March 1. We’re breaking down the Home Edition qualifier into two separate monthly events (March and April). The top two players during each month will be included. The format for this event will be the same as discussed previously: throughout each month, players will post five scores on each 2018 course. Only their five best games in Stats, Glory or Invitationals will count toward their final total score. Great Shot Points will serve as a tiebreaker. Once our two players for March qualify, they will be removed from the April contest. The leaderboard will be cleared and we will qualify two more players under the same format. Please note: to qualify, you must play be a Home Edition owner and play on your own 2018 game. During the final few days of April, we will award three spots for the World Championship based on three separate events. Mix-Up Monday Golden Ticket: Monday, April 23: The winner of our Mix-Up Monday Daily Contest event. In the instance that the day’s winner already qualified, we will give a spot to the first player on the leaderboard without their spot secured. Money $hot Golden Ticket: Thursday, April 26: The winner of this day’s Money $hot is in—just one shot is all it takes. In the instance that the day’s winner already qualified, we will give a spot to the first player on the leaderboard without their spot secured. Money $hot Golden Ticket: Friday, April 27: The winner of this day’s Money $hot is in—just one shot is all it takes. In the instance that the day’s winner already qualified, we will give a spot to the first player on the leaderboard without their spot secured. Three of the 64 spots will be awarded to winners of Golden Tee tournaments. Two of these spots have already been filled. Club Lucky’s Tournament of Champions, won by Paul Luna and Power Events’ Player of the Year event, won by Andy Fox, have already claimed their spots. The winner of Game Time Amusements’ 2018 event will also claim a place in Vegas. Please note: If qualified players are unable to make it to the World Championship for any reason, Incredible Technologies has sole discretion in regards to filling the remaining spots to secure a full field for the World Championship. A traditional qualifier will take place on Saturday, June 9, with the tournament field gunning for the top 32—aka the Championship Bracket. All players who don’t make the top 32 will be placed in the Sliver Bracket. Sunday, June 10 will be head-to-head match play for the final standings. The Silver Bracket will be single-elimination, while the Championship Bracket will be double-elimination. First place in the Championship Bracket will take home $20,000, and second-place will take home $10,000. While we are still finalizing total payouts across both brackets, no player who qualifies and participates will walk away with less than $450 cash, on top of other goodies we will reveal along the way. By the evening of a June 10, the Golden Tee World Championship match will be played on The Orleans Showroom stage, streamed live to the rest of the world. We have more details on the weekend, including a hotel room block at The Orleans that will be available to players, other perks of qualifying, specific payouts and plenty more. For now, hone your skills and get ready for February 1—the day the qualifier madness will begin. And be sure to stay tuned to GoldenTee.com as a new era of Worlds begins.